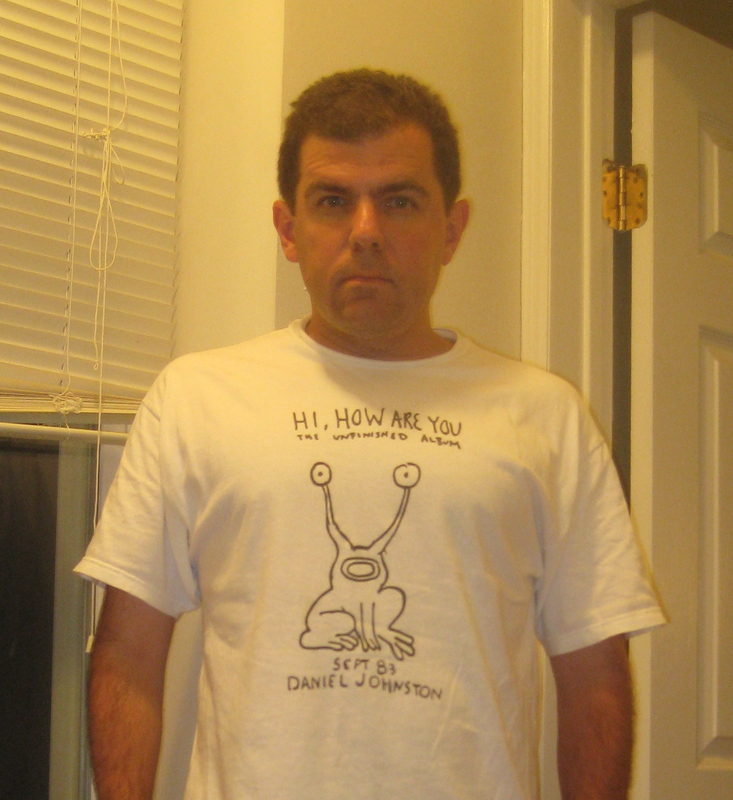 Yesterday I wore my Daniel Johnston t-shirt. No special reason; it was near the top of my t-shirt drawer. (T-shirt drawer #1, anyway. I have a lot of t-shirts.) 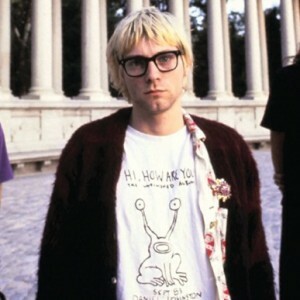 I first learned of Daniel Johnston when I was a college DJ at Pittsburgh’s WRCT. The station had a recording of Daniel doing an impromptu over-the-phone version of his song “Speeding Motorcycle” with Yo La Tengo. Little did I know then that Yo La Tengo would become one of my all-time favorite bands, or that I would live in their home base of Hoboken, New Jersey. Johnston would also become a favorite. He was indie music’s entry into the hallowed “fragile mad-genius songwriter” camp, popularized by Brian Wilson, Syd Barrett, and Roky Erickson. Johnston’s raw but heartbreakingly beautiful homemade cassettes from the early ’80s were being reissued on compact disc in the early ’90s, increasing his exposure. The t-shirt—reproducing the cover of Daniel’s Hi, How Are You album—became iconic when Kurt Cobain (no slouch in the troubled-young-songwriter arena, himself) wore it to the 1992 MTV Video Music Awards. I’ve seen Johnston perform live three times. The first was a very under-attended show at Maxwell’s in Hoboken in the mid-to-late-’90s. That’s when I bought the shirt, which I was wearing last night at Tierney’s Tavern in Montclair, New Jersey. A couple of bands on the bill had direct connections to New Jersey indie-rock legends the Feelies, and 3 of the 5 Feelies were in attendance. 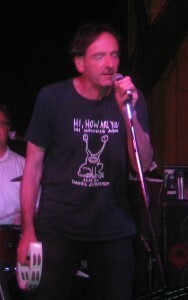 Weckerman was called up on-stage at Tierney’s, and lo and behold, he was wearing a Daniel Johnston t-shirt. Struck me as coincidental, but I wasn’t shocked. In 2008, I had a brief chat with Weckerman at Maxwell’s, as the reunited Feelies were warming up for a big Fourth-of-July show in Manhattan. He was wearing the Johnston shirt, which sparked our conversation. Totally nice guy. No, sir, he did not. In fact, I like to think that maybe, somewhere out in Texas, he was feeling just a little more alive. Great meeting you Jack. In another instance of small world/NJ… I happened to meet “The Champ” not 2 months ago, at a wake for a mutual friend. Super nice guy, Chuck. Class act. 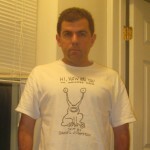 I noticed you at Tierney’s with the Daniel Johnston shirt and thought, “Huh, what are the odds?” Nice post! Thanks to you both! I hope to make it to Weckerfest next weekend…. You know that our mutual friend Jerry’s ex, Terry, is the person who offered Daniel the really great record deal (that Daniel did not end up signing) in the film, right? I did not know that, good sir! That’s pretty cool. The small world gets smaller. 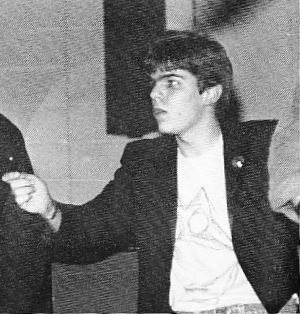 And of course Jerry’s brother made the “Cavern” video in 1983 for my good friend Sal’s band Liquid Liquid. I admire his song “I did Acid with Caroline.” Out of the ten or so times I tripped, only once was I lucky to be with a girl with whom I shared a sort of romance. The peak happened on a sunny day in the mountains snowshoeing, but other moments of the day were psychedelically squeamish. Basically our art aesthetics differed; I was/am more Bob Ross, and she was more Daniel Johnston.